Professional social networks is the focus of Thing 8 and looks at LinkedIn and Academia.edu. In my earlier blog post for Thing 7 my LinkedIn profile featured as one of 9 results returned on the first page. 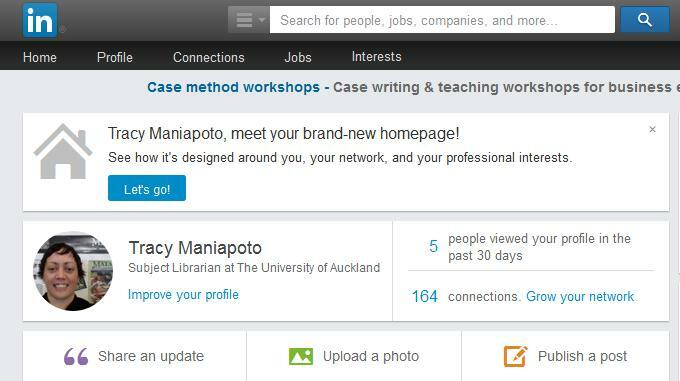 In terms of professional networking, my LinkedIn profile features my work history, experiences and skills and connections with 164 individuals within my network sectors of education and libraries. I created this profile some time ago (I don’t actually recall when) and try to keep it up to date – you never know what job opportunities might come your way. My LinkedIn profile was also accepted for use on my Staff Directory Profile (interestingly, my Twitter profile was not). Do I think this is a good way to present a professional profile? Yes, and I particularly like that its an independent tool which you can take with you when you move from one workplace to another without the need to start again. I haven’t really explored Academia.edu and will add that to my to do list. It may even feature later on as a blog post!